The Food Forest Ashburton project idea came from local residents as part of the Sustainable Neighbourhoods Project. The Sustainable Neighbourhoods Project is a community development program funded by The Victorian Government’s 2009 Sustainability Fund. The project has been working with members of the Ashburton community to increase participation in environmental sustainability activities and to start new innovative projects. 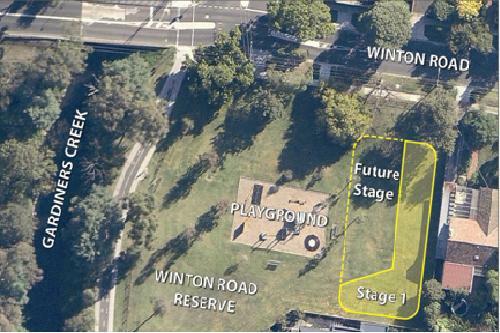 The Winton Road community food forest is located at 38 Winton Rd, Ashburton 3147. It is unfenced and open to the public with the idea that the neighbourhood shares the produce in a fair and equitable manner. The site is managed organically and sustainably with the aim that all edible produce is grown in as healthy an environment as possible. In late October 2012 a new gravel path was constructed, the grass was removed mechanically and the site covered with wood chip mulch. Tree planting commenced in early November 2012 with 13 young fruit and nut trees planted as part of the Stage 1 development of the site. Stage 2 in 2016 included an extension of the forest plantings with 13 more trees and a picnic table with seats and a shelter built by council. The food forest is modelled on the ecosystem of a forest but with the main components consisting of edible species and supporting plants. It has several “forest layers” and is home to fruit trees and shrubs, edible vines, edible and medicinal herbs and groundcovers. Plants are selected to perform multiple ecological roles – promoting growth of other plants, inhibiting weeds, shelter (for people, birds and little creatures), mulch, pest control, bird food, cross-pollination, attracting beneficial insects and of course providing food. The food forest is planted and maintained by and for the community. Our aim is to reduce carbon footprint and increase food security for the future. We really love your site, it has interesting content, Thanks! we are trying in Gainesville, FL USA, too!